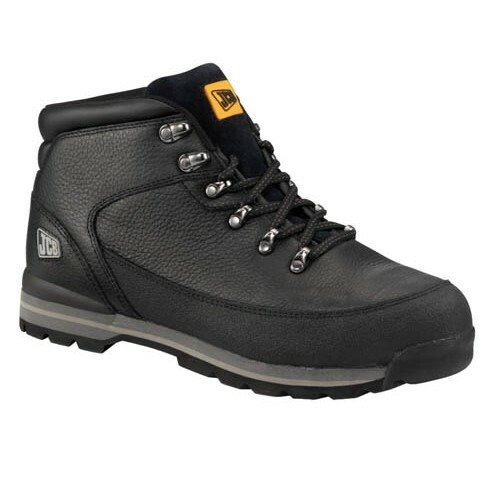 The JCB 3CX Safety Boot is a fully waterproof with a waterproof and breathable lining, this JCB 3CX Work Boot is in black leather, with a lightweight EVA and rubber sole for added comfort. The JCB 3CX safety boot has an antistatic oil resistant and slip resistant rubber outsole with a pierce resistant steel midsole. 200 joules toe protection. The JCB safety footwear collection comprises of over eighteen styles, each one manufactured to the same exacting standards as the machinery which name it bears. Each style has its own individual attributes, including the distinctive yellow and black branding on the sole and upper, and all but two of the styles are waterproof and breathable, providing complete protection in all conditions.